Saturday night at the Fillmore is going to be an early highlight of your 2019. 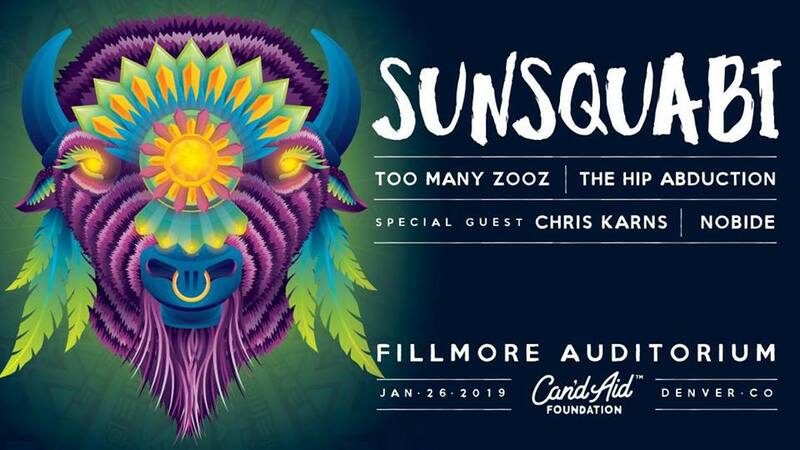 The stacked lineup, headlined by Denver electronica trio SunSquabi, features Too Many Zooz, The Hip Abduction, Chris Karns and Nobide. With a plethora of audial flavors, the night will feature a variety of sounds that will keep your body moving. With the recent release of their third studio project, Instinct, SunSquabi has been evolving their sound through inspiration from the outside world, heavy touring and converting their live jams into studio hits. The Squab train combines the talents of Kevin Donohue (guitars/keys/production), Josh Fairman (bassist/synth) and Chris Anderson (drums). This project rewards a deep understanding or rhythm and song structure. The seasoned musicians have the ability to stay in the pocket for the sake of building well-developed lines and climaxes. The ultimate three piece combo – SunSquabi has been capturing the hearts of music fans around the world with their ever-evolving sound in the studio and on the live stage. The Squab boys have shared the stage with the likes of STS9, Griz, Gramatik, and Umphrey’s McGee displaying their ability to gel well with eclectic audiences of music fans. They have cultivated a unique audience that joins fans who share interests in funk, jazz, classical, and beyond into the realms of EDM. Also joining the lineup is one of the scene’s most improbable trios, Too Many Zooz. This Brasshouse collective is made up of Leo Pellegrino (baritone sax), Matt “Doe” Murihead (Trumpet) and David Parks on drums. The group found the spotlight when a video of them crushing some heavy brass/drums instrumentals at their old subway stomping ground went viral, and the rest is history. The Hip Abduction is also joining the party! The group is a afro-pop/indie-rock band from St Petersburg, weaving together Western pop aesthetics with African rhythms and traditions. Their 2013 self titled release debuted on the Billboard charts and continues to top the iTunes charts. The band describe themselves as “wanderlust-inspired global pop” and have cited influences such as The Black Seeds, Vampire Weekend, Paul Simon, and Ali Farka Toure. Also joining the bill is DMC World Champion Chris Karns. Karns has made his name with his impeccable cuts, touring with Pretty Lights, and sit-ins with local legends such as Adam Deitch and Borahm Lee. Nobide is the final group on the bill; we spoke with them last week about their background in music and the formation of their group.